So first off, the manual can be helpful, but it seams laid out strangely and mostly for planes. So here are some things that I would love. 1 how to set up fail safe. It would be nice if my quads cut throttle when they drift out of range, or some warning that I am approaching the limits of my range. How to tune my quads. You briefly mentioned some vibration around center stick and adjusting your p, but the values vary greatly depending on battery and weight. Would it be good to have clones of all of my setups? So ZMR with go pro and one model, 150 2s, 150 3s, 150 4s and so on? 150 4s...That is crazy talk. I would also love something like horizon mode. Maybe I should have gone with a naze-32 if that was what I wanted, I guess I could get into rate mode, but switching back and forth is what I currently do. Something in between would be incredible. Maybe we can have someone from Graupner do this? Seriously I am happy as a clam, I could just be happier and I think other users would be too. 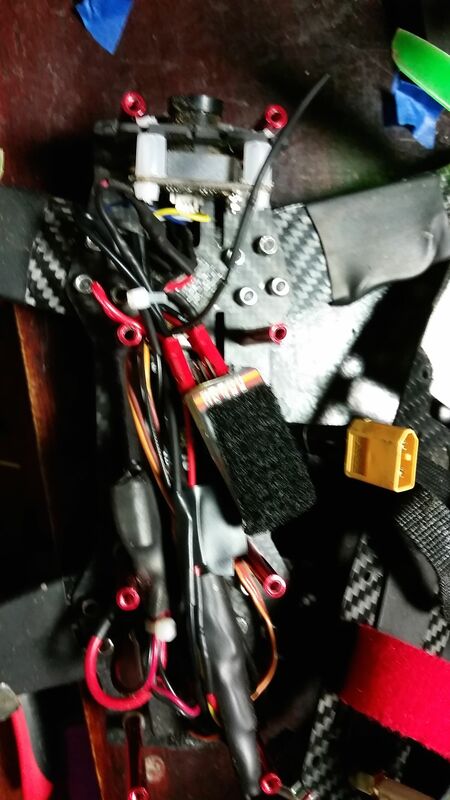 So while I had the lid off I moved the VTX to the back and cleaned up some of the wiring. I ended up binding it and following Josh's original setup video. The thing is, it flies pretty well. I want to know how to get the most out of it though. Lest start up with a tutorial on how to set up failsafe. Wouldn't that be a good idea? So tonight I decided to try to figure out setting up a failsafe. I probably should have waited to experiment and see if it worked until tomorrow, but I am not smart. A battery, a prop, some shredded carpet and a cut hand later I believe I have failsafe set up. Next time I will try harder to be safer and smarter. First off, the opening screen. This shows that the model selected is model 3. 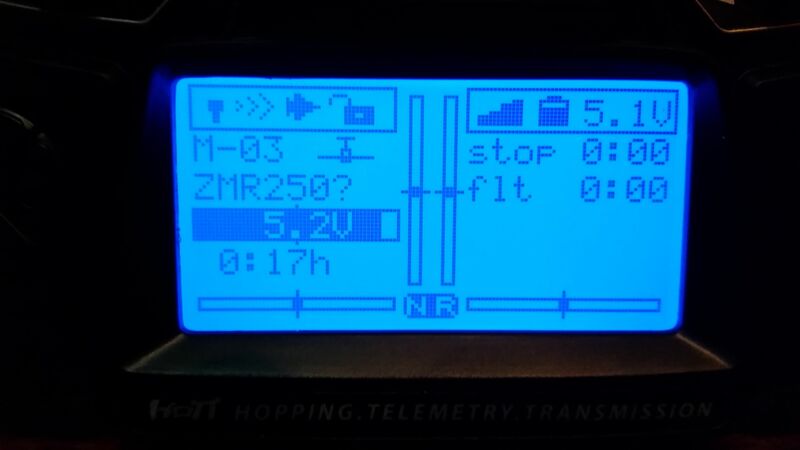 So originally I was hoping to have different PID settings for my zmr. so I copied the model from slot1 to slot 3. The problem here is that binding doesn't seem to copy over along with the other settings, so you have to rebind the receiver to the new slot. The problem there is that binding to the new slot gets rid of binding to the first slot. SO long story short having multiple PID setups for carrying a camera or not is going to have to rely more on me remembering 2 sets of numbers, and remembering to change things. Which I find annoying, but I guess I'll have to get over it or stop changing things up. This screen is what happens when you press enter while looking at the opening screen. This is how you get to the receiver setup to change failsafe. You have to scroll all the way across to failsafe which seams pretty intuitive...even for a guy like me. When you do get to failsafe these are your options. I decided that the numbers represent the channels, three being the throttle? so your options are hold or pos, the problem here is they don't say what pos or hold mean. I'm going to assume hold means stay where you are? and pos means some predetermined number that I don't have access to adjust? Who knows? SO I set 3 which I believe is throttle to pos. I took off, hovered about 4 feet up, and then turned off the transmitter. (that is the only way I know to test failsafe outside of going outside and flying straight away from myself until things stop responding. The quad slowly lowered itself to the ground which is when all hell broke loose. It drifted back, crashed and then ate part of the carpet. The frilly part at the end. Instead of throttling all the way down mind you the motors actually spun up trying to compensate for the fact that the quad was no longer level...Oh...did I mention the battery slipped out and was getting repeatedly smacked by a broken prop? The prop cut through the side of the battery's shrink wrap. I don't think it cut the foil, but I'm not risking explaining a smoking lipo fire to the wife. I ended up getting smacked on the palm by a prop pulling the battery out. Not my proudest moment, but I guess I'm taking one for team graupner tonight. Why oh why do we never have a camera running when the quad goes wild and humps the ceiling, flips upside down and goes on a flower garden rampage or chews up part of the rug? Sorry about your hand. Those lessons stay with you a while. 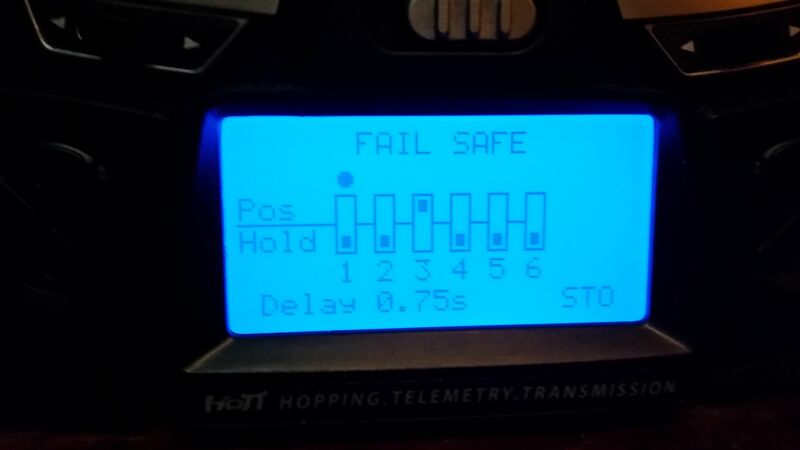 I recommend you test failsafe with the props OFF. Arm the copter on the bench, spin up motors and turn the transmitter off. You get unlimited, painless second chances. With the D4R-IIs and X4Rs I have to set the pos on the receiver after binding. I have to turn on transmitter and rx, then push the bind button on the rx and turn the tx off, then reboot everything. This sets my rx to 'fall out of the sky' mode in failsafe. I also set failsafe on the flight controller and test that by spinning up the motors and unplugging the rx from the FC. 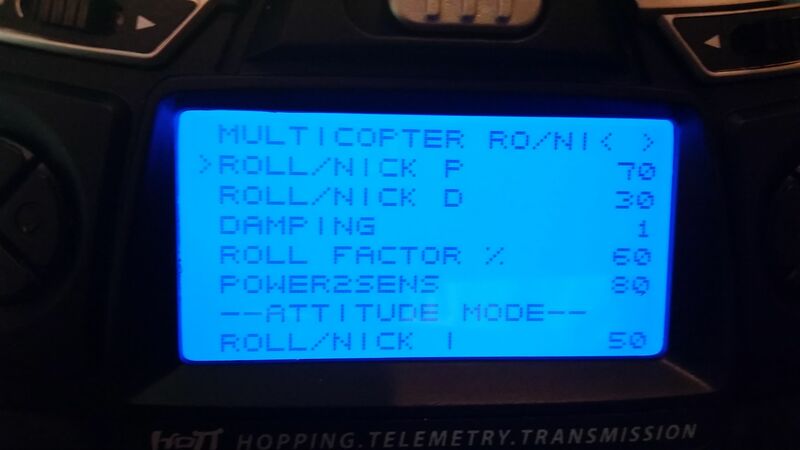 I don't suppose you can do that with the Graupner, but with a Naze32 and D4R-IIs it is an important step. So after last night's fun I decided to work on tuning. You get to this screen by pressing the telemetry button and then scrolling across through a few screens. So here we have the top of the screen for setting what I believe is the right stick's P and D settings. For I you have to scroll down. It is my understanding that P is how "stable" the quad is, that is how much it resists change, or maybe how hard it fights to "get back to level?" In any case, I think I am supposed to be listening for/looking for the quad to over correct and wobble if P is set too high. So I increased P by 10 for several rounds. Each round, I took off and wiggled the quad, and here is where I sort of got into trouble. I was using one of my cheap batteries. So I'm assuming every time I took off I had slightly lower voltage. So, I was less likely to generate a wobble? At 80 I thought there was a slight wobble so I backed off to 75. Then I swapped the battery and noticed a really slight wobble so I backed off to 70 and while I still think there is a slight wobble I think it is very slight so I'll live with it for now. The other thing that I messed with was agility. This actually seemed to have the biggest effect on creating the wobble from before. Agility's default is 3. A pretty docile quad that is nice and pleasant to fly. I first increased it to 6. I think this increased the maximum lean angle. (I almost want to know what 10 would be ) So when I played with this the wobble seemed to increase exponentially so I backed it off to 4. I'll have to look I may have been daring and gone with 5. I left I and D at their defaults though now that I think about it the quad is more stable now that I increased P and more controllable now that I increased the agility. So I guess progress was made today. I also tested failsafe outside a few times figuring a crash should be expected. This time I set the first 4 channels to pos figuring the quad would level out and fall out of the sky. It did as predicted, but once it got close to the ground it drifted backwards and all hell broke loose. First time it backed into the back bumper of my new car...No damage to the car thank goodness, but the quad ended up upsides down under the car screaming like a banshy before cutting itself off. Because of the surgery on my sinus flying FPV is painful so I didn't get to really test it out on my home course. I plan on doing that tomorrow no matter what. I figure the pain will be worth seeing how the changes effect things. I'm having trouble getting my quad to fly level when in rate mode. It always tilts to the right, and i have to fight it with the stick. Any advice? Edit: I'm using the same transmitter receiver combo as you. Sounds like it needs to have level recalibrated. After switching on your multicopter, the gyro is already active but not yet initialized. To initialize it, hold the Multicopter still after switching on, preferably on a flat surface. The calibration will be done only when the receiver is completely still. After approximately three seconds you will hear beeps emitted by all motors. The signal tone can vary depending on the ESC model. The beeps will stop when the calibration and initialization is complete. Wait until the initialization is complete beforeyou start the model! The motors will not start until the calibration iscomplete. 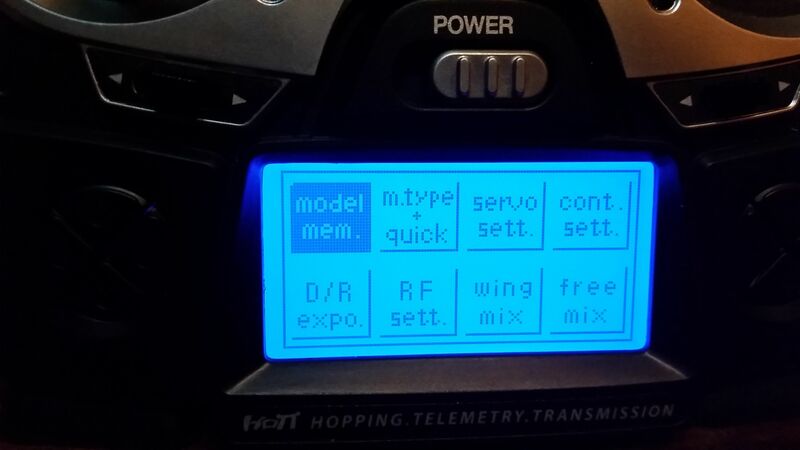 Turn on both your transmitter and quad. Put the quad down on a flat level surface. Make sure it is sitting as flat as possible. Landing gear can be a problem here depending. Go to tlm, then scroll across to multicopter base. Click down to calibr. position no, and click enter. Then press the up arrow. It will switch to yes and then back to no. This tells your quad what level is. If you still have the drift, try again, only tilt the quad in the opposite direction of the tilt with a few playing cards. You can also check your sticks to make sure they are centered properly by clicking the view button.